I grew up in Alphabet Town, the part of Chicago where the north-south streets are organized by initial—the best street-name plan in the city. Those of you who think the city ends at Halsted may be surprised to learn about Alphabet Town. It begins just west of Pulaski, where the streets start with K. The K streets are succeeded after Cicero by the L streets; after Central come the M streets; and Narragansett leads off the Ns. On the north side, where Chicago extends farther west, there are even O and P streets. It's not clear who came up with the initial idea, but the plan at one time was to have all our north-south streets ("avenues," formally) alphabetized: a mile of A streets, followed by a mile of B streets, and so on. It's also not clear why the plan was only partially implemented, and why it started with the Ks. A speck of a similar intelligent design exists on the southeast side, where for a mile the north-south street names run from Avenue A to O. Imagine how much easier it'd have been to navigate Chicago if the alphabet plan had been consummated citywide. There'd have been no need to figure out how far west Hoyne was, or how far east Dorchester; you'd have simply headed for the Hs or the Ds. Alphabet Town residents can find their way home more easily after a night of drinking. A tipsy K-Towner on a westbound bus will look out the window, note that he's already in the Ls, and realize he's gone too far. This only works, of course, if he's not so drunk that the alphabet is moving around on him. I grew up on Kilbourn, in the heart of K-Town. To the east were Kenneth, Kostner, Kolin, Kildare, Keeler, Kedvale, Karlov, and Komensky; to the west, Kolmar, Knox, Kilpatrick, and Keating. A street named Tripp had snuck its way into K-Town, perplexing us—why wasn't it Kripp? West of us was an L of a neighborhood, from Lacrosse to Luna. Moving up in the world meant advancing in the alphabet. My family scrimped and saved, and when I was ten we moved two letters west, to a home on 59th Street between Melvina and Moody. We M-Towners looked down on L-Towners, while N-Towners looked down on us. 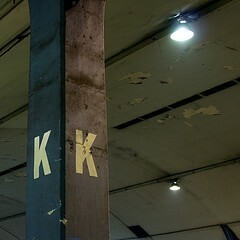 In my teens I went out with a K-Towner over my parents' objections—she was from the wrong side of the alphabet. Mixed-letter relationships aren't necessarily ill-fated, however; I know a woman from Oriole who married a guy from Kilpatrick, and it's worked out OK. I hope Chicago and Alphabet Town expand one letter west some day. Q-Town would be a curious place.